Any program that uses GUI (graphical user interface) such as Java application written for windows, is event driven. Event describes the change in state of any object. For Example : Pressing a button, Entering a character in Textbox, Clicking or Dragging a mouse, etc. Events : An event is a change in state of an object. Events Source : Event source is an object that generates an event. Listeners : A listener is an object that listens to the event. A listener gets notified when an event occurs. How Events are handled ? A source generates an Event and send it to one or more listeners registered with the source. Once event is received by the listener, they process the event and then return. Events are supported by a number of Java packages, like java.util, java.awt and java.awt.event. 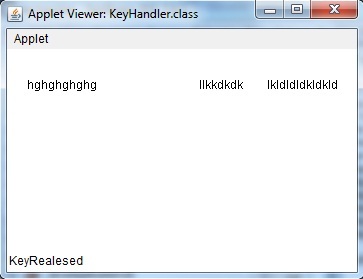 Implement appropriate interface in the class. Register the component with the listener.